We look at Living Social being bought by Groupon. This is a good thing because there is now one less daily deals company. For a lot of Restaurants, daily deals are a very dangerous process, and often a symptom of a dying business. We talk about an $8.38 marketing campaign that filled a cafe in Western Australia with customers buying their highest margin item. We go through the process so you can run the exact same campaign. 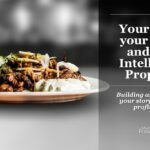 We talk about the formula for making a Restaurant profitable. This is a very simple formula and it is used in lots of different types of business, but we will go through what it looks like for your Restaurant. Customers x Average number of transactions x Average Sale Amount = Revenue. We discuss all of the ways that you can effect each of these numbers. This is a great discussion about how some of our customers are making a really big difference in the profitability of their Restaurant. 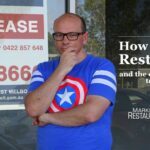 James Eling: Hey, it’s James from Marketing4Restaurants and welcome to episode 32 of Secret Sauce, the restaurant marketing podcast, five levers for Restaurant profitability and five free ways to increase each of them. James: Hey, hey, welcome back. How did everyone go with the free restaurant CRM (customer relationship management) system? This is a super exciting feature that we’re releasing for all of our customers. It’s an evolution of our booking system and our online ordering system. Really giving a lot more clarity to our customers and making a really big difference, which is super exciting. If you didn’t have a listen to it, have a listen to the way that you can, completely free, create an CRM system for your restaurant which gives you much better idea about each and every one of your customers. So, today we’ve got a few things to cover. We’re going to talk quickly about Living Social being bought by Groupon. We’re going to talk about how we filled up a café for breakfast with a marketing budget of $8.36. That is super exciting, and then we’re going to talk about the five levers for restaurant profitability. It’s a very, very basic formula. I would be surprised if you haven’t seen this before if you’ve done any research into things. Now, we first came in contact with this probably 10 or 15 years ago when we had an action coach in our business. And that’s why I think a lot of restaurants owners are working 70 hours a week, because of the fact that it’s very easy to drop a fulltime wage and just do it yourself. Now, the scary thing is one of the things that I get some of our customers to do is how many hours do you work and what is the hourly rate that you’re paying yourself? You know, there are some people who are taking home a lot less than $50,000 and yet they’re working 70 hours a week. Now, that’s just crazy. So, what we want to do is we want to be able to get you to be able to increase the profitability in your restaurant so that you can then hire more people, so that you’re not doing the day to day work in the restaurant. Really important that you’re able to avoid that. So, we’re going to come up with all of these ways which will give you a better idea about the profitability in a restaurant, and the things that you can do to increase it, so that’s super exciting. So, first off, Living Social was bought by Groupon. Hurray, so now there’s one less daily deals company in the world, and everyone is feeling fine. Daily deals, I think, you know, it was all super exciting when it first came out, and Groupon pushed a really great message about how they could bring new customers into your restaurant. I think we all know how that really pans out though. They’re Groupon customers, they come into your restaurant, they eat, it’s hard to upsell them, and then they go and they don’t come back until you run another Groupon campaign, okay. The hidden undercurrent of this idea was the fact that a percentage of people aren’t going to redeem the vouchers so that you’ll make money off that. But I think that you need to be very sophisticated. And look, don’t get me wrong, I know people who do make money out of Groupon campaigns. They are very sophisticated operators, though. And for the average person who thinks, “It’s a bit quiet, I’m going to run a Groupon campaign,” generally it’s going to fail. You won’t make money out of it, you’re going to upset your normal customers. You might convert some of your normal customers into Groupon customers, there’s a whole range of things that can go wrong with it. And I think, just having a look at the Groupon share price, that’s collapsed as well. It’s really struggle town for them. I, for one, think that that is a good thing for the local restaurant, there are much better ways that you can be going and bringing new customers into your restaurant. Which is a perfect segue into how did we spend $8.38 to fill a café? So, this is a café in Western Australia, rang up and said, “Look, you know, we’re really struggling. It’s been a quiet winter for us and we’ve got a lot more competition opening up in the local area.” So, we said, “Okay, let’s have a think about it.” Now, there’s about 30,000 people I think in Facebook in the town. This is one of the things that a lot of people don’t think about when they’re running a marketing campaign, what’s your total addressable market? It’s a good question. The smaller it is the harder it is to market. So, he said, “Look, we do really good pancakes.” “Okay, let’s run a pancake campaign.” And he sent through a photo of some pancakes and, I’ve got to tell you, I wasn’t super happy with the photo. It wasn’t a great photo. But, look, we ran with it anyway. If you’re going to do a marketing campaign just spend an extra 10 seconds on making sure that you’ve got a decent smart phone with a decent camera and decent light to take a decent photo. Pour a little bit of extra cream on top of it, maple syrup, all of those sort of things. The things that make a pancake photo awesome. This wasn’t an awesome photo but we ran with it anyway. The campaign started off on a Friday, on Monday we got some feedback from the customer. And he said, “Saturday was pretty quiet. It was raining and there was a show on in the town, so the whole street was pretty dead.” Okay. He said, though, Sunday was the busiest day that they’d had all winter and the restaurant was full and everyone was ordering pancakes. And he’s put in brackets, “(Which is our highest margin item). Keep up the great work.” Now, super exciting. A, we spent $8.38 to fill the café. More importantly, and you know I’m excited by this, because you’ve got a café owner who actually knows what his highest margin product is. The number of times I talk to restaurant owners and I say, “What’s your highest margin product?” And they go, “I don’t know.” And you’re thinking, “There’s so many things that you’re missing out on with that.” By not doing a proper engineering approach to the way that you sell, which is really important. And that sort of leads onto the five levers for restaurant profitability. Okay, now check out the show notes because there’s lots of good details in there around this. It’s a little bit mathematical, so it depends on how good your maths is. But I’ll go through the entire formula and then we’re going to break each one of them down. So, the number of leads that you get multiplied by your conversion rate equals the number of customers. Now, the number of customers multiplied by your average transactions multiplied by the average sale equals revenue. And revenue multiplied by profit margin equals profits, okay. Now, it doesn’t matter what business you’re in, but we’re all in restaurant businesses. So, what we’re going to do now is we’re going to start going through what each one of those means and the thing that I love about this is that we’re not completely talking about changing the way that you do business fundamentally. What we’re looking for is the one and two percenters. Can you increase the number of leads? Can you increase your conversion rate? Because the thing is when you start making, you know, two, three, four percent changes, you know, introducing two or three things to each of these levers you get this really cool compounding effect. Which means that you could be dropping maybe another 30 or 40% to your bottom line. If you’re running a marginal business, there’s so many restaurants out there that are marginal. You know, where after they pay themselves a below market rate, there’s very little profit left in the restaurant. Now, the thing is that all of the increase and profitability, that’s just going to flow to the bottom line. And if your turnovers half a million dollars and there’s very little profit involved, you can easily drop and extra $50,000 to the bottom line by making some changes to these levers. Now, hey, that’s pretty sweet. This is simple maths, as well. So, we’re just going to go through it right now. So, the number of leads, now in a restaurant business I think that the easiest way to understand the number of leads is it’s going to be things like how many people go to your website? If you’re out selling something, you might say, “Well, I’ve got 10 people that I’m going to call on this week.” We don’t operate like that. Restaurants operate where that decision is actually often made without any interaction from the restaurant, often. So, someone is looking for an Indian restaurant in your suburb, someone’s looking for a Chinese restaurant to have a corporate function. You become a lead when they go to the website. And it’s not just the website. It’s also, you’ve got to think about word of mouth, you’ve got to think about, you know, do people see your flyers. Some people do get a decent result with flyers, particularly takeout. Ads in newspapers. Now, I don’t think that that works. We actually met someone who was still working with Yellow Pages. Now, that’s just crazy bananas, because those solutions don’t work. Zomato, a lot of people struggle with that. Spending quite a lot of money for very little return. Whenever you’re spending marketing dollars, you always want to sort of look at what is the return that you’re getting from it. So, the average restaurant website gets about 1,000 visits per month. Now, that can be dramatically higher, and we’ve seen getting restaurants getting 20,000, 30,000 a month if they’re high profile, if they’ve got some great PR. I’ve seen restaurants who are getting 100 visits a month, particularly, usually before they come across us, that can happen. If they’ve got a Wix website, or a website that’s very heavy on graphics, you can be getting very few customers. So, 1,026–that’s kind of average. There’s a lot of things that you can do to increase that, and the number one thing there is search engine optimization. What is the problem that you solve if I had that problem what would I type into Google? And, you know, looking for the best restaurant in suburb name. Looking for an Indian restaurant, looking for a gluten-free restaurant, looking for a vegetarian restaurant. You know, are you doing those sort of things? Now, another thing that I like to think about, from a conversion point of view, is the number of people who are seeing you on Facebook. Are you running a promotion on Facebook? Because you can get very, very low traction, particularly on things like Facebook Live and Facebook video ads, and we’re going to be talking about that Facebook Live shortly. But a great way to get your restaurant in front of a lot more people. So, you’ve got SEO on the website. Now, conversion rate. The conversion rate is the number of people who go to your website. And let’s face it, people who go to your website, they’ve probably got a fairly high intent. If some people just randomly look at restaurant websites, very few people do. They’re thinking, “Should I go out for dinner this weekend? What is there?” Your conversion rate, because I always say your website should be doing two things, sales and marketing. SEO is the marketing component. Your conversion rate comes down to a couple of things, I think. The two biggest sales people in your team are: 1.) Your menu. So, what is your signature dish? What is the dish that looks fantastic? On the menu, in a written description, so that I go, “Wow. I would love to have that. Let’s go there tonight.” And 2.) Photo. And so, we talked about the pancakes before. What are the items that just look drop dead gorgeous in a photo? Because I want to go to a website and I want to go, “Wow, look at that. That is what I want to eat tonight.” Because you want to close the transaction there. And so, ideally, it’ll go to an online booking system where you get the email address. Now, how effective is that? Now, it depends on what country you’re in, it depends on the uptake of online ordering versus none-online ordering, and it’s very different across countries. The United States tends to be a little bit more advanced. Australia’s slowly catching up. But some Australian figures, for every 24 visits to a website will produce a seat booked. Now, some are converting a lot higher than that. Some a lot lower. So, what are the factors that influence that conversion rate? And the first thing is what are the photos there that look like? What is it that makes you unique? How do you tell that story on the website? That’s the first thing. Now, one of the other components that you need to think about though is how many people book online. Now, I think that a lot of this comes down to psychology. So, online marketing is all about psychology, I think. And one of the good things that I’ve done in my career is three years of undergrad psych. I have a personality type that kind of means that I don’t like to make online bookings. I am much, much, much more likely to just roll up and wing it. So, you can do a great job of SEO and I find your website and I go, “Wow, look at that roast turkey. Look at that dessert. This place looks awesome. I’m definitely going to go there.” I will not book, I’m just going to roll up. Unless, of course, there are things like, “Bookings essential.” Now, some people don’t do that. It can be a little bit of a two-edge sword because sometimes, you know, people don’t like being told bookings essential when they go there and there’s only five people there. Or, if you know that it’s in demand. So, we booked for Alinea because I knew that they were booked out three months in advance, and they were just going to laugh at me if I said, “Is there any chance of a table for two tonight?” That was never going to happen. So, when I’m forced to I will make a booking and I know that there’s a lot of people out there who don’t like making bookings, whether it’s for privacy reasons, whether it’s their psychological profile. A whole heap of reasons. There are a lot of people out there who are still uncomfortable with technology. So, I’m thinking obviously an older demographic and if you focus on an older demographic then your telephone is going to be really, really important to you. How many people make a telephone booking? Because there are people who do like the certainty of knowing, “I made a booking.” If they’re not comfortable with online, then you should definitely be making sure that you’re able to take those phone bookings. The other component is walk-ins. How many people walked in because they were walking along, they were in an area where they thought they’d gone to an area. And so, like in Melbourne, I’m thinking somewhere like Lygon Street, there would be 50 restaurants within a kilometre. Very densely packed restaurant area. People will just say, “Well, let’s go to Lygon Street.” And they will decide as they’re walking by and so very aggressive market, very cut throat dealing with people who are walking in. But what I’m thinking is how many people have gone to your website? How many people have seen the photo of your hero meal and decided to go, and then they just walk in and say, “I’d like a table for four.” Because that’s me. And that’s the thing that I think is really interesting that conversion rate, like, the thing I love about online marketing is that you can actually see, you run a Facebook campaign, or there’s a Google search and that results in this booking here, so you made money from that search. But you also have to remember that a lot of people will use the telephone and a lot of people will just walk in. And I know that some people, Dimmi at one stage, was saying that only 1 in 10 people made a booking online. Now, I suspect that it’s probably at about 15%, so that means that every 4 visits to your website is going to generate a seat. Now, that’s a pretty high number when you think what’s the average spend in your restaurant? If it’s $50, that’s $12 per visit. That can be quite high. So, $12 a visit, the average restaurant doing 1,000 visits a month, you’re looking at $12,000 a month. You’re looking at $144,000, we’re nearly $150,000 from just that channel. So, not from your repeat, not from your walk-ins. And the important thing is that this is average data. And I think that that average data is probably, you know, the average restaurant and the average restaurant doesn’t do that well. I know that we’ve got customers who are getting twice as many visits and are generating a booking much more frequently than every 24, they’re booking much more frequently than every 24. So, they’re probably generating, I know for a fact that we’ve got restaurants who are generating over half a million dollars a year out of their website. Which is a really interesting fact when you think that some people think that they’re fine just getting by with Facebook. Now, if you’re doing takeout, it’s the exact same thing. So, some restaurants are getting an order every seven visits. In fact, I looked at one, he’s getting an order every seven visits, the average order is $60, he’s getting nearly $10 per visit. So, driving traffic to that website is one of the things that they focus a lot on because of the fact that they know they’re making money out of it. Which is pretty exciting. So, that’s your conversion ratio. I think the main things are menu and photos. And you’ll notice that I haven’t talked about discounts, there’s a lot of things that you can do. You know, you might mention a happy hour. We don’t want to talk about discounting too much, because I think that there’s so much work that can be done outside of discounting that that’s where you want to start focusing. Discounting is a last resort, because you’re giving money away. And if it’s really hard to generate customers on a Tuesday night, then maybe that’s the night that you discount. Maybe that’s the night that you want to try and pull some of your Saturday night diners to Tuesday night, so that you’re not turning away people on a Saturday night. You never want to turn customers away, let’s try and bring some of that excess demand through to a Tuesday night. Great images make a big difference there. So, your number of leads multiplied by your conversion rate gives you the number of customers, okay. Now, customers times the number of transactions times your average sale equals revenue. So, let’s break that little part of the formula down. The number of transactions. Now, this is partially internal and partially marketing, okay. So, from a restaurants point of view, how do you increase the number of transactions? Okay, the first thing that you’ve got to do is provide the three Gs of restaurant marketing: great food, great value, great experience. Are you providing great food? Are you providing great value? Are you providing great experience? And you need to be really brutally honest with yourself, because this is the thing that could be stopping you from running the kind of restaurant business that you always wanted. The number of times that I’ve been told by restaurant owners that they cook food that is absolutely amazing and then I go to the restaurant and I think, “This is absolutely amazingly the same as everyone else or worse,” that’s the amazing part is that people think that their food’s amazing when it’s not that amazing. If you think that it’s amazing, have you done market research? Have you eaten at your competitors? What is it that you’ve done to make it amazing? There’s a lot of things that need to go, you know, front of house has got to be right, back of house has got to be right, your pricing has got to be right. Now, I’m not saying cheap, okay. So, please, please, please when I say great value, do not think that I’m talking about making it cheap because that’s just crazy. It’s a perfectly valid business model to try and be super cheap, so you’re going to be high volume, you’re going to sell lots and lots and lots and lots of burgers. But at minimal profit on each one, that’s how you’re going to make a profit. Look, that’s fine and somewhere like, you know, In-N-Out Burger, that’s how they roll. They do a truckload of burgers and they’re super cheap. That’s cool, I get that. But Alinea, probably one of the best value meals that we’ve ever had, it’s also one of the most expensive. And I talk about that because I think it’s really important that the most expensive meal provided some of the best value that we ever got. That was exciting. So, that’s the first part of it. What do you do to get people to come back? That’s the second part of it. You’ve got to be top-of-mind when people are thinking about going out. Or, you want to create in their mind the problem that you solve. So, I’m sitting at my desk, it’s a Tuesday and I’m working really hard and I’m tired, and then email pops into my inbox and it says, “Tonight we’re doing a special seven-course Penfolds station matched wine pairing.” You know what, that would be really exciting, I’ve earnt that. I’ve worked really hard today, that would be exciting. Or, maybe it’s a, if I have worked really hard, maybe that’s not the message that you want to be trying to push. Maybe it’s, “How about tonight come in, rather than tea for the kids, come in and, you know, kids eat free.” Well, the kids would like to go out tonight and maybe tonight’s the night that we would do that. Are you top of mind when your customers are thinking about going out? So, “Let’s go out on the weekend, I would like to back to this restaurant because it was really good.” Or, are you trying to create the opportunity to get people to come out? Because far too few restaurants actually try and do either of those things. They’re not working to be top of mind, and they’re not working to create the opportunity to get someone to come out. This is that whole the number of transactions. How many of your customers come in just once and never come back? Now, something to think about in your business and marketing plan, which we all know that everyone’s got, don’t we? In your business plan, what is the sector? How much of your customers are going to be tourist? Because I know, like, we’ve got customers on the Gold Coast, and the number of customers who go back to them is very few. Because of the fact that if I give them my email address and they send me the best offer in the world for the most exciting seafood in the world, I’m not going to take it up because I’m not on the Gold Coast. I eat there when I’m traveling to the Gold Coast which is, you know, maybe once a year. So, it’s very hard to get repeat customers out of that. There are other restaurants, so that cafe in WA that we were talking about, the vast majority of their customers are going to be repeat customers because of the fact that it’s such a small community. So, you need to be really focused on providing the great food, great value, great experience, because that’s a really key component in getting the customers to come back. If they think it was really expensive, they’re much less likely to come back to you. So, you need to go out and find someone new. Now, it’s a lot more expensive to find someone new than it is to get an existing customer who knows that you’ve got a great chef, who knows that the front of house staff are really bubbly and friendly, and knows that in their mind they’re getting great value for what it is that you provide. So, they’re the kind of things that you want to be thinking about. Because that’s the number of transactions and one of the things that you want to think about is long-term customer value. So, in a tourist area, your long-term customer value, because that’s the average amount that they spend multiplied by the number of times that they come back, it’s going to be low because they’re only going to eat with you once. But it feeds into the next part of it. What’s the average dollar sale? What are your takings per seat, okay? What are the takings per seat? Now, a lot of this component goes to partially the menu, where are the embedded upsells in the menu? Because the thing that’s important about that is that you’re not relying on front of house to do the upsell, however, training up front of house to be able to go in for the upsell I think is really important. “Have you decided on what wine you would like today?” That is a very gentle way of suggesting, you know, you should buy some wine. A nice simple question like that, I often say what’s one of the most powerful restaurant marketing phrases in the world? And it is, “Would you like fries with that?” Would you like fries with that, I mean, how many billions of dollars of potatoes has been sold with that one phrase? Are you suggesting an entrée? Are you suggesting a side with the main? Are you suggesting a dessert, you know? Do you have a killer dessert menu? A lot of the times, people don’t get their menu working hard enough. I have been at restaurants where I’ve thought, “You know what, I’ve had a lot to eat today. I’m just going to go in I’m either going to get, you know, maybe a couple of sharing plates or an entrée and a main. I’m going to skep dessert, because that would be healthy for me.” And then you just look at the menu and you feel crushed, because you know that you have to eat that dessert. Do you have a dessert like that? That people just go, “I have to order that because it sounds completely epic.” What is that dessert? How do you sell that dessert? How do you get more people to order that dessert from you? And then it’s the same for beverage sales, you know. What are you doing around the drinks? You know, can you get that extra sale in there? This is your average sale. So, putting the number of customers that you’ve got in times the number of times that they’re going to come in multiplied by the average sale. That’s going to equal your revenue. Number of transactions. So, the number of times that they’re coming back. Two things with that email database and Facebook retargeting. So, there are some restaurants out here who have had 20,000 people go to their website while they’ve been logged into Facebook in the last six months, which means that they can then run an ad to those people. The pancake ad that we ran, that was targeted at everyone in that location. So, we weren’t even targeting the people who had already been there. If those pancakes are awesome, and they did look pretty good, if those pancakes are awesome how much easier do you think it would be to run that campaign once a month for, you know, four or five days to drive people to come in and to be really, really, really busy? And the thing I love about it when you’re really, really busy is that people come by and they’re walking by and they say, “Wow, that place is really, really, really busy. We should come back. They’re full now but we should come back.” And that’s how you start driving demand during the week. That’s how you start driving the demand across your quiet services. That’s what you need to be thinking about. Facebook retargeting is a really, really powerful way of doing that. I get emails from Hotel Faena in Argentina. We’re not planning on going back to Buenos Aires. I love getting them, though, because that reminds me of a really happy time, our trip to Argentina. I don’t view that a spam. You know, I get that email it’s like, “Wow, that was really nice. I remember that.” You should be driving the same sort of emotional feeling when you send out an email. And you know what, you might just say, “Okay, you know what, we’re the local Indian restaurant and we struggle with all of that.” Okay, that’s fine. Here is the final thing that I’m hoping you will understand why email marketing is so important. You may not be doing it but, you know what, some of your competitors will be. So, if you’ve got the best Vindaloo in our suburb, I’m not going to be tasting it because I’m locked in by someone’s who’s sending out that email. This is the thing that really worries me is that people, they kind of in a little bit of vortex around, “We shouldn’t be doing email marketing.” It’s the same as SEO, “You know, SEO’s not really that important.” That’s why we call SEO the silent killer, because if you’ve got a website that’s not pulling its weight as part of the marketing then all of the people who are looking for the solution that you provide are going somewhere else, because someone else would be targeting those people. You need to think about that. So, we’ve got your revenue. Now, revenue times profit margin equals profit, that’s pretty simple, isn’t it? Now, as I said before with the pancakes, I love the fact that they knew what their highest margin item was. Have you costed your menu? Have you? have you recosted it? Have you reviewed it? You know, the purchase price of product changes. Are you looking for ways that you can make it cheaper? Is there a supplier who can provide a cheaper solution? Can you change the menu without effecting the taste or improving the taste with a cheaper item? When you’ve looked at the menu, have you broken them down into the four categories, you know? Dogs, puzzles, plough horses, and stars. Do you know, because there should be no dogs on your menu. So, if you’re not familiar with menu engineering, a dog is something that doesn’t create a lot of profit for you and doesn’t get ordered very much. Why is it on there? Get rid of it, no one’s ordering it and you don’t want them to order it. Because it doesn’t create any profit for you. So, plough horses they’re high in popularity but low in profit. So, lots of people order them but you don’t make a lot of money out of them. Now, there’s an argument for having the plough horses, because of the fact that it gives you the opportunity to upsell, you know, whether it’s an entrée or a dessert, beverage sales, all of those sort of things. It might draw people in. so, there’s an argument for that but you need to have a think about it. Puzzles, low in popularity but high in profit. And I think, you know, they’re called a puzzle because the puzzle is how do you describe it on the menu? Can you change the name of it and increase the number of times that people do it? Could you get the servers to be recommending it more often? How do you get more people to order it? Because you want them to order it. And then, of course, stars, they’re high in popularity and you make a lot of money out of them. And they’re the ones that you love. You could have a Rockstar menu. You want to have as many stars in there as possible. Super important. But you’ve got to cost this stuff out. You’re not going to get anywhere without costing it out. One of the things I think’s really important is, you know, before a shift starts you want to get the chef to make up a couple of the stars and a couple of the puzzles and get the team to have it. Because the number of times, and places that do this really clever, you say, “What would you recommend?” “You know what, the chef cooked this up tonight and it was beautiful. It was just absolutely amazing.” “Okay, I’ll have that.” Now, I’ve just been sold and the number of times you wonder if any thinking has gone into that. Is this the highest margin product that they make? Or, is it just something that the server likes? Are you incentivising, you know, do you need to incentivise the staff around the number of the high profit items that they’re selling? Have you done any training around that? If you haven’t done the costings of it, you’re never going to know. And I think that that’s a fundamental issue. Too many restaurants don’t know what they’re making out. Too many of them say, “Yeah, I think that we make a lot of money out of this.” You think. And then they do the costings and then they’re horrified by how little money they’re making out of it. And I’ve seen this time and time again, and I’ve seen it in restaurants that are closed down. There was one that we went to and the guy realized, after six months, he sat down and costed the menu because I said, “You need to cost this, because you’ve got no idea.” And he ended up putting his prices up 30%, the interesting thing was not one of his customers complained. The sad thing was he did it too late and he had to shut the doors because he ran out of money. A fundamental error, absolutely fundamental. Unforgivable. You don’t want to be selling something without knowing the cost to produce it, that’s crazy. So, there we go. Number of leads times your conversion rate. Number of leads is SEO and, you know, your Facebook engagement. Conversion rate, what is it that you’ve done to close the sale? Photos, menus, those sort of things can make a really big difference. That gives you the number of customers. Average number of transactions. What are you doing to drive people to come back? Are you building a database of your customers? Are you retargeting them on Facebook? Simple and easy ways of doing it. Average sale, front of house to look for the upsell to push people towards those extra dollar items to grow your revenue. And then revenue times profit margin equals your profit. So, making sure that your menu’s costed, making sure that front of house is pushing the items that you want people to order. 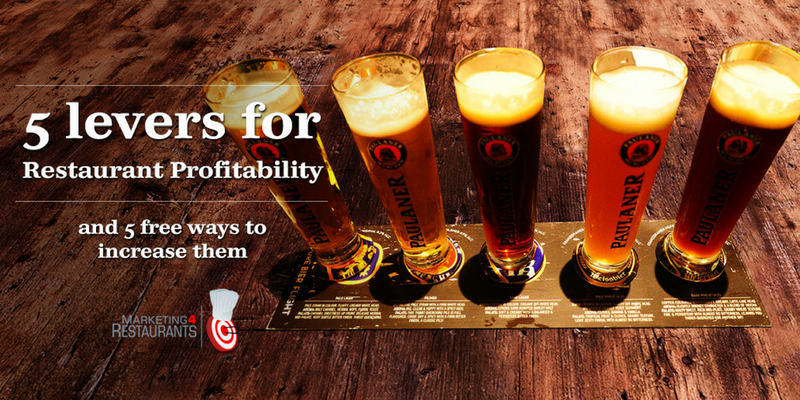 Five levers for profitability in your restaurant. I hope that there’s something in here that you can take away. It’s not rocket science. This is why I love this equation. It is not rocket science. I hope I’ve broken it down for you in a nice and simple way, so that you can then think about it. And, you know, think about these things and over the next week or two just start going through and making those little bits of changes. Because if you make a 2% increase, it’s more than 10% across each of those. Because you’ve got a compounding effect, and what you should be doing is probably quarterly trying to drive each one of those just that little bit higher. An ongoing process to look at those numbers and to try and impact them. That’s why I wanted to highlight what the levers were, so that you could have a better understanding. They become KPIs in your business. They become the things, because they are the determinates of the profitability in your restaurant. And that’s what I’m hoping to be able to do. Let’s drop a little bit more cash to your bottom line, which you can then use to employ more staff. Hopefully you’ll be no work in the restaurant, which means that you can then work a leisurely 20 to 30 hours a week on the restaurant. Which means that you’re then well and truly on the way to having the kind of restaurant business that you always wanted, leading the kind of restaurant owner lifestyle that you always wanted. Spend some more time with your family. There you go, so we’ve covered a lot of ground today, hopefully you’ve got something out of it. If you can, please share details about the podcast. We’re doing a Facebook livestream every week. So, follow us on Facebook, share those, I think we’re trying to wrap up the interesting things that we’re seeing on a weekly basis. And please, please, please leave a review in iTunes, it makes a really big difference for us and it really helps us get the word out to other restaurant owners. And that’s what we’re super passionate about, trying to help restaurant owners all over the world and it’s exciting. We’re in five countries now, and a big part of that has been listeners to Secret Sauce who’ve listened and discovered something new, reached out to us, now they’re a customer. That’s super exciting. So, that’s it. Have a busy day. Bye.